"783.-Portage R.R. Bridge, from Picnic Grove"
"Views on the Line of the Erie Railroad"
This view was taken from the north east side of the Portage Wooden Bridge. 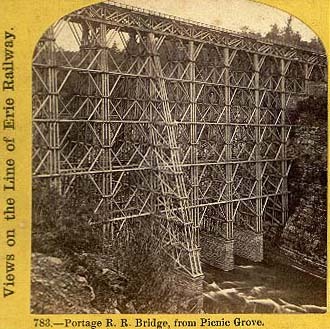 The "picnic grove" was a level spot to the north and below of the Erie railroad tracks. It provided a great view of the Portage Bridge. In 1875 George Williams built a 25' X 60 ' open dance hall complete with a rustic entrance and a band stand. It was here that the Soldier's Picnics were held. For more information, see our Glimpse of the Portage Bridge.